In some parts of the world, however, the potholes that vex County Councils and insurers across the country pale into insignificance. 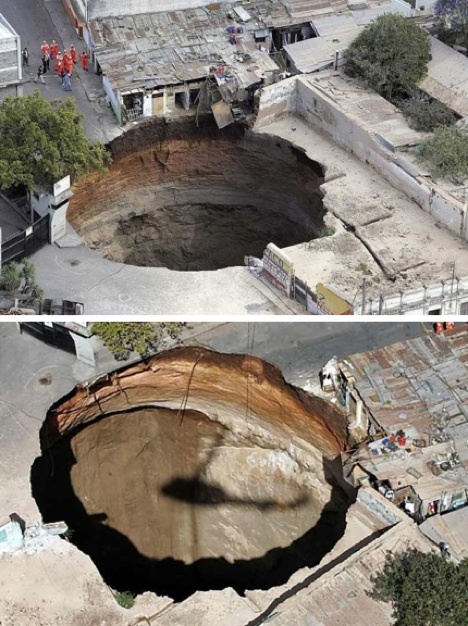 Sinkholes are of a very different order of magnitude. Once again, there is an interaction between water and minerals, but the result is of a wholly different order of magnitude. One of the most shocking stories in recent years comes from Guatemala. For weeks local residents in Guatemala City had heard rumblings and had no idea what was causing them. Then, suddenly, in February 2007, the ground suddenly fell away 30 stories almost instantly. It is quite breath-taking, both in its geometry and scale, two dying and a thousand being evacuated. I can’t imagine it. Going to bed one night, everything as you expect it, the next day seeing a hole in your back garden hundreds of feet deep. Somehow, we develop a sense that nature changes slowly. Sinkholes join earthquakes and other “sudden change” phenomena that somehow seem unnatural. In Venezuela, there is a flat-topped mountain which is punctuated with the Sarisariñama holes, four sinkholes that are particularly beautiful to look at. Each is a self-contained eco-system, some supporting species found nowhere else on Earth. The largest sinkhole is in Egypt, where the mindbogglingly large Qattara Depression is 80km wide by 120 km long. Unlike the Sarisariñama, the Qattara Depression is completely lifeless. For more information, the Sinkhole Report logs new sinkholes in urban and natural settings. Below is a gallery of these strange, beautiful but terrifying phenomena. And finally, and judging by its record with Essex potholes, I hope Essex County Council doesn’t have to deal with one of these any time soon.